When's the right time to start building hype? These days, Assassin's Creed stands as a flagship franchise for Ubisoft. Sure, the company has a stable of hits, but none is more closely associated with the publisher. Before the franchise debuted in 2007, Ubisoft was known as the company of Rayman and Prince of Persia. But Assassin's Creed launched to huge consumer interest and incredible sales. Future iterations of the game helped define a template for open-world games that many throughout the industry have emulated (including Ubisoft itself, naturally). However, review scores on Assassin's Creed were unusually split. Ubisoft decided it had over-hyped the game, and took a different tack with 2008's reboot of Prince of Persia. 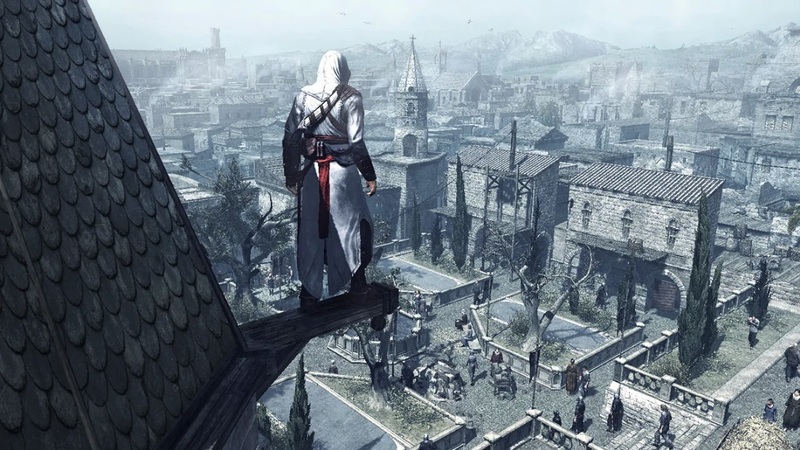 Instead of the year-long build-up Assassin's Creed received before launch, the publisher decided Prince of Persia would benefit instead from a "compressed" PR and marketing plan for the game, which was to launch that Christmas. That involved not having a proper reveal until May, and not letting press get hands-on with it until after E3, which was happening in July that year, already a month later than usual. "We basically took the Assassin's Creed style of marketing and PR of what to show when and we compressed it down. Teaser first, trailer plus hands-off second, another trailer plus hands-on third etc.," Prince of Persia creative director Ben Mattes told us at the time. "We're following that same sort of pattern. But whereas they did it over a year, we're doing it over six months. But hopefully we'll generate suitable levels of hype and buzz." So did it work? Prince of Persia did marginally better with reviewers, topping out at a Metacritic score of 85 for the PS3 compared to the Assassin's Creed high of 81 for PS3 and Xbox 360. However, the reboot was not the commercial success of Assassin's Creed, and failed to spawn sequels. Two years later Ubisoft would return to the prior Prince of Persia series with another entry to take advantage of the Jake Gyllenhaal feature film adaptation, but the franchise has largely lain fallow since then. These days, Ubisoft's marketing pushes seem to be dependent on how long a franchise has gone without a new entry. When a series has annualized installments like Assassin's Creed, Ubisoft has generally gone with the compressed marketing schedule, no doubt to avoid stepping on the toes of each new release. When a series goes a couple years between entries, the game's proper reveal comes a bit earlier (nine months for Far Cry 5, a full year for The Division 2). In those rare instances where the franchise is Beyond Good & Evil, Ubisoft announces the sequel in 2008, showcases the gameplay in 2018, and releases it hopefully at some point before the heat death of the universe. Every now and then we get a taste of what that sort of intrigue could look like in the video game world. In July of 2008, the newly merged Activision Blizzard signed its top talent to new five-year contracts, including the top names at Infinity Ward, Neversoft, and Blizzard. Less than two years into the Infinity Ward contract extensions, Activision fired Jason West and Vince Zampella for what it claimed were "breaches of contract and insubordination." "Those are the core assets of the new company... The three of them are paying the bills," said Bruce Hack, vice chairman of Activision Blizzard at the time. While compensation wasn't disclosed, these are the types of moves sports fans would approve of. You've had some success, go ahead and lock in your core players for a while. It might cost you a fair bit but top talent is tough to replace, they're proven performers, and you can always worry about role players later. It's just smart management. That said, free agent contracts in sports have a history of going thoroughly, hilariously wrong (provided it's not your team that signed them) and the biggest contracts often get cut short by trade or buyout or injury or retirement or circumstance. That's sometimes the case in games, as less than two years into the Infinity Ward contract extensions, Activision fired Jason West and Vince Zampella and had them escorted out of the building for what it claimed were "breaches of contract and insubordination." That touched off a flurry of legal action. The same week, West and Zampella filed a $1 billion suit for damages and unpaid royalties over Call of Duty: Modern Warfare 2. A group of 40 Infinity Ward developers also filed suit separately for as much as $125 million in unpaid royalties with up to $500 million in punitive damages on top of that. Activision counter-sued West and Zampella. Activision then sued Electronic Arts, claiming the rival publisher was illegally conspiring with West and Zampella to derail the Call of Duty franchise. In the end, this entire fiasco was settled, West, Zampella, and the Infinity War developers got paid at least some of what they were owed, and anyone curious about the evolving relationship between large publishers and the top development talent they rely on got a glimpse of how the sausage was made. West and Zampella would go on to start Respawn Entertainment with the backing of EA, who acquired the studio outright just last year. We've covered the weird, down-sized experimental E3s of 2007 and 2008 a number of times in this space, but July marks the actual 10th anniversary of E3 2008, which combined a later date on the calendar, a smaller turnout of about 5,000 invited attendees, and the same Los Angeles Convention Center venue as the traditional large-scale E3 to create a trade show utterly devoid of excitement during a time when the console industry it represented was absolutely thriving. 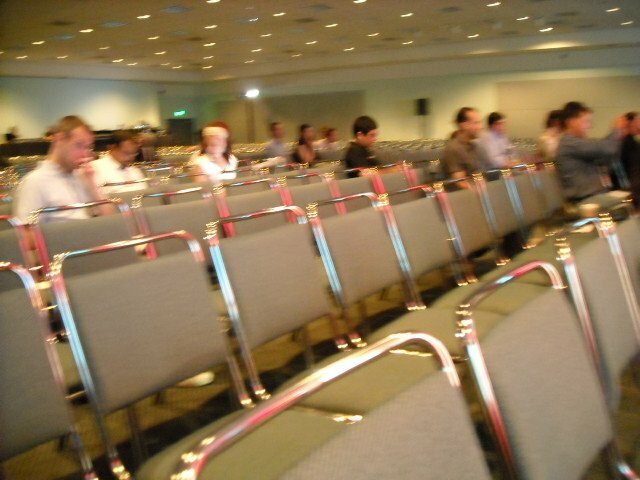 A photo of the Perry keynote crowd, pulled from my write-up of the event for GameSpot. We didn't blur the faces; I'm just a terrible photographer. The reviews were suitably harsh. Ubisoft's Alain Corre said the timing and location were "inappropriate." The publisher's US president Laurent Detoc said it was "terrible... like a pipe-fitters show in the basement." Electronic Arts CEO John Riccitiello hated to see it like this. Acclaim's David Perry called it "broken," "stupid," and "an embarrassment." EA Sports president Peter Moore called it "soulless." Before the event, Wedbush analyst Michael Pachter said the show's new spot on the calendar made it "virtually useless for retail and investors" and afterward warned it was "headed for extinction". But nothing topped the surreal, awkward schadenfreude of E3 2008's keynote address, in which Texas Governor (and future bad presidential candidate) Rick Perry delivered a speech in a massive ballroom with seating to accommodate 1,000 people. Only about two dozen showed up, and they helpfully scattered themselves around the room to maximize the absurdity. E3 stopped doing keynotes after that. ● Here's the president of the Academy of Interactive Arts and Sciences saying that game reviewers are lazy, because when your group's mission is "the advancement and recognition of the interactive arts," the thing you really want to do is belittle and antagonize the people in the media most directly responsible for recognizing advancement in your interactive art. ● Google launched its Second Life-like 3D virtual world, Google Lively. It would die a quick death just four months later. ● Happy 10th anniversary to GOG.com, the digital storefront dedicated (at the time) to older classics from yesteryear! To refresh your memory of how short the shelf life of games was at the time, GOG's original lineup of dusty retro offerings included Freespace 2 (10 years old), Operation Flashpoint (7 years old), and TOCA Race Driver 3 (Two and a half years old). ● 2008 was a brutal year for studio closures all the way around, and July added Venom Games, Midway LA, Flagship Studios, and Pivotal Games to the pile. ● At the same time, 2008 saw a new wave of forward-looking studios gaining traction. While all those studios were shutting down in July, Riot Games landed $7 million in funding to make its then-unannounced debut project, League of Legends.